For many, driving season ends shortly after the leaves turn and fall from their branches. Sports cars are tucked away in garages to protect them from the sleet, snow, ice, salt, and the chaos that ensues. Few are willing to keep their pride and joy on the road through the harsh winter months, and for them, the monotony of the "daily driver" brings forth the slow and painful wait for spring. However, Asim and Larry at Livery Wheel have taken a radically different approach. Instead, they've embraced the ice and snow, taking on a mission to show that even when the world has frozen over, they'll be in no rush for things to thaw. Along side the doldrums of winter and daily drivers come steel wheels and snow tires, chains and more. Road conditions continuously worsen, and potholes grow large enough to feasibly consume entire shopping centers. 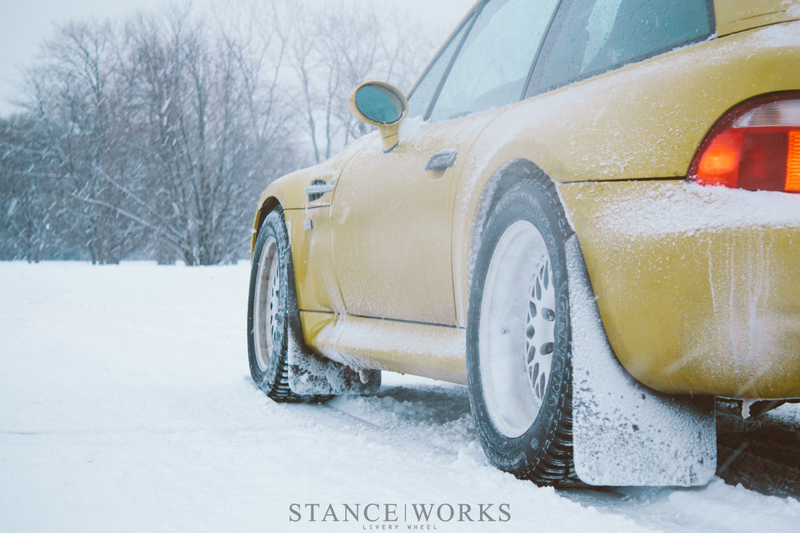 Winter is, for many cars, the ultimate test of endurance and reliability, from bumper to bumper, top to bottom. In response, those with the the means choose to store their cars for the harshest of the seasons, while others resort to making the best of the cards they've been dealt. 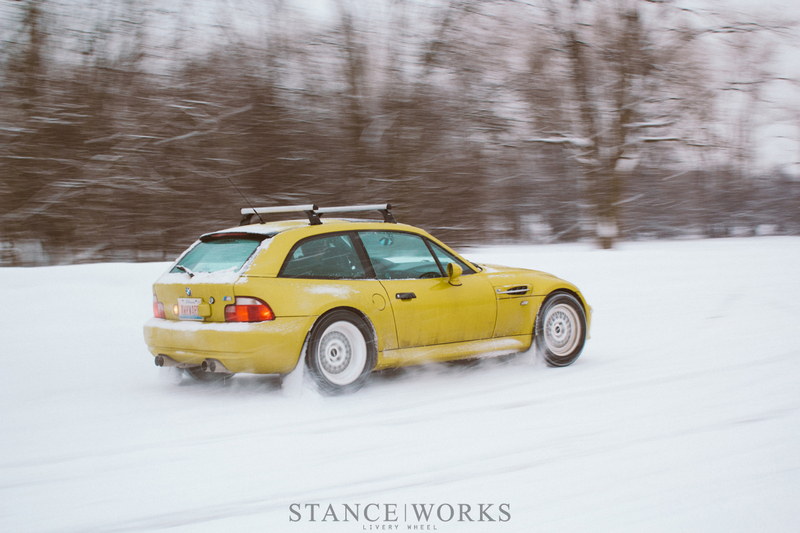 "Winter mode" is a self-inflicted condition many of us are all too aware of: our cars are often raised back up, and the brake dust-caked stock alloys we've always been too lazy to clean are pulled from the cobweb-filled back corner of the garage, where the dryer lint always seems to gather. Some of the prettiest cars of the season suddenly look worse than their stock counterparts, and through this, the fun-to-drive cars we've built become all but useless. 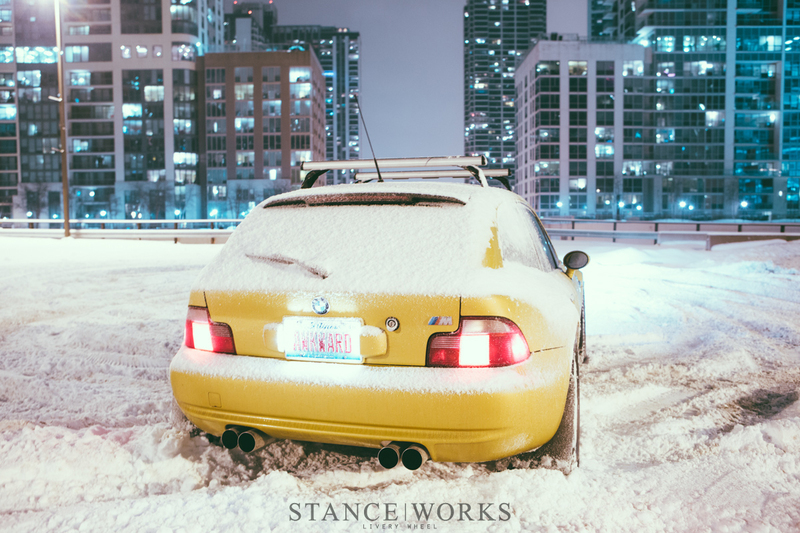 Winter can be the bane of a car enthusiast's existence; not everyone is fortunate enough to live under the year-round sun of coastal climates. Despite this, the guys at Livery Wheel have donned their winter coats. While this build does nothing to break new ground, they're taking a new step forward, further defining their brand identity and ethos. More importantly, they're having some serious fun. As the world hands them a lemon-flavored polar vortex, they've made it their playground. 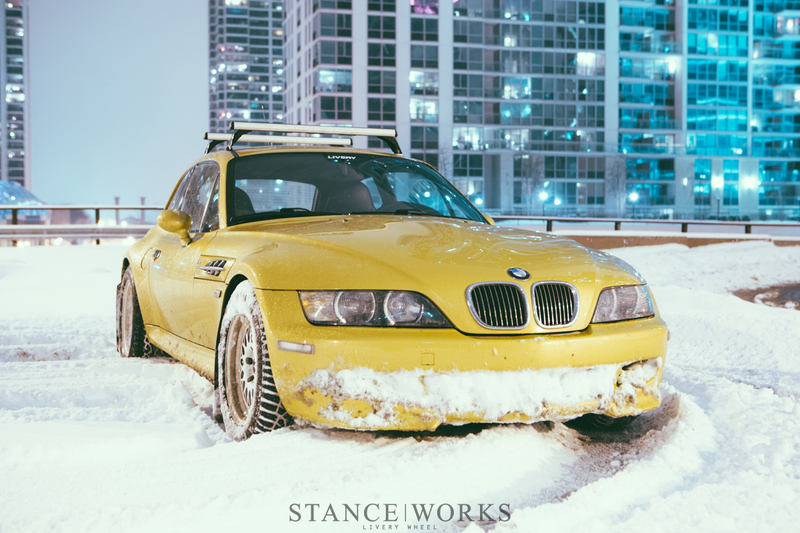 What better way to handle the conditions than to build a snow-conquering BMW with the tools they've given themselves? 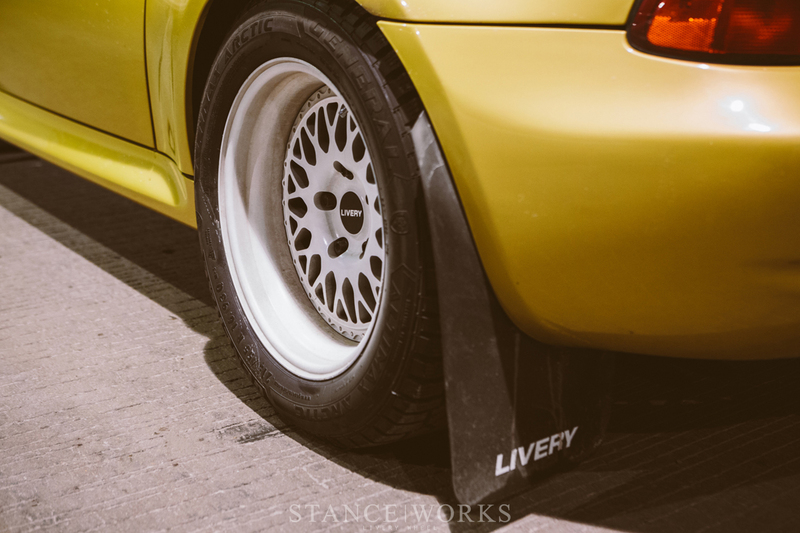 Livery Wheel, in its simplest form, is born from the passion and excitement of two BMW-loving wheel gurus who have decided to forge their own path, creating wheels that embrace their love for aesthetics, style, and motorsports. However, the two live in snow-covered cities of New York and Chicago. It'd be easy for them to "call it quits" through the winter months, however, despite 2014's monumental snowfall, it wouldn't seem right for two wheel guys, and moreover, a newborn wheel company, to fall into the typical lull of "winter mode." Instead, they've decided to give the term new meaning, and built a wheel and tire package worthy of the ultimate urban excursion. Unlike road wheel & tire packages, all-out width isn't the name of the game here. For maximum traction, Larry and Asim built up 16x7.5" Livery Protos to sit on each corner. Due to the massive offset differences between front and rear, the fronts use 2" outers and tally up to a +21 offset, while the rears received 3.5" outers with a -18 offset. Fitted on all four corners is a set of 215/55 General Alitmax Arctic knobby snow tires. With the coilovers wound up instead of down, and Liveried (heh!) mudflaps installed, the two have effectively put together an S54-powered 315-horsepower snow mobile. Best of all, the photos make it abundantly clear that they did more than give the setup a simple "daily commute." Larry and Asim are drivers, through and through. 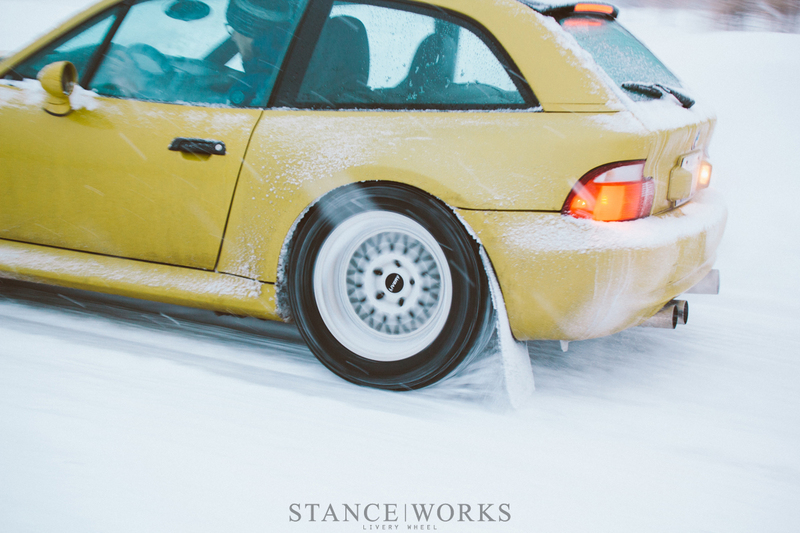 Giving up their cars through the harshest winter in years seemed counter-intuitive, and with a new wheel company at their finger tips, it only made sense to ford the caustic salt and chemicals that coat the roads, and to pull from all sources of inspiration, rally included. Larry put it simply: "Sports cars make great daily drivers," but it's a sentiment that he doesn't believe should follow the weather, nor should one need the excuse of clear skies to go for a drive. 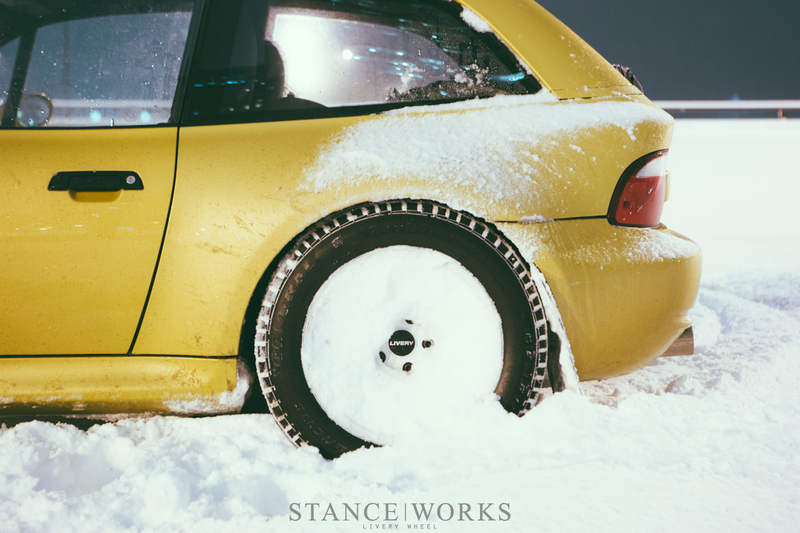 Cars are year-round, and they built wheels to prove the point. 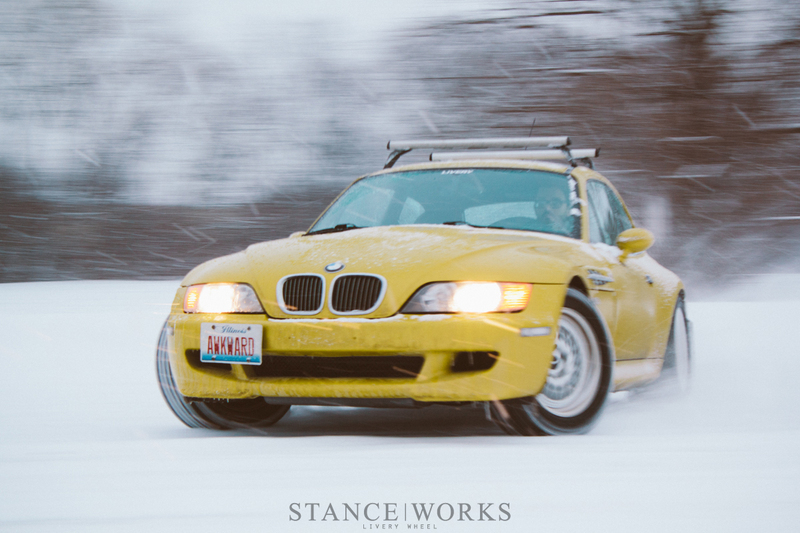 The final goal, aside from the inherent statements such a build makes, was to have fun, and put the Phoenix Yellow M Coupe to work, perhaps harder than ever, tapping the rev-limiter in open fields and snow-covered lots every chance they got. 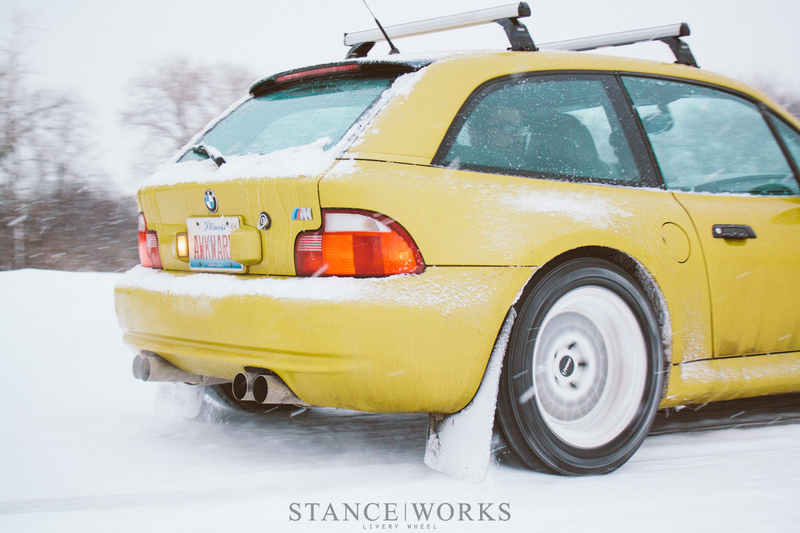 We're glad to see friends making the best of the northern climate, and sending home a positive message on otherwise bleak times for car lovers. Spring is just around the corner, and for many, already here - hopefully the snow tires can make their way back to the dark, dirty corner of the garage for another 9 months. The wheels, however.. well, maybe they can stick around. Nice article and shots guys. ///M looks like a chief. 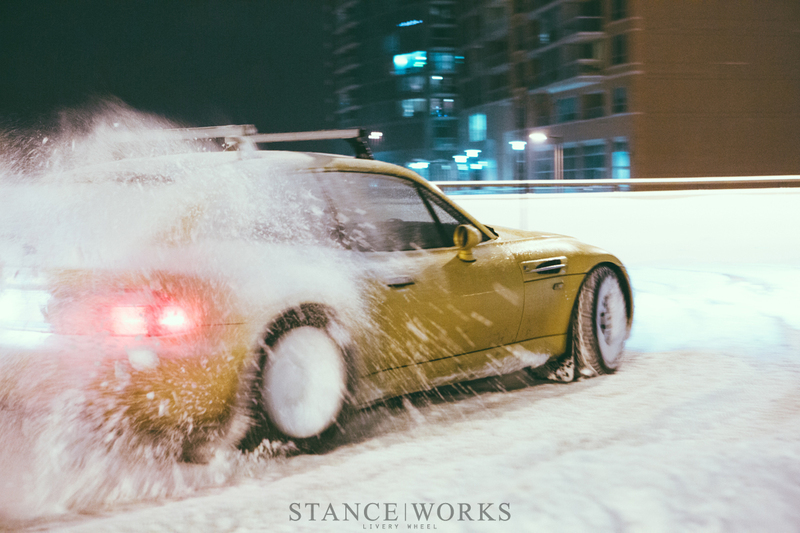 Fully inspired to pull out my car for the winter. Now wheres that can of plastidip for the underside….. Easily one of my favourite posts to date. 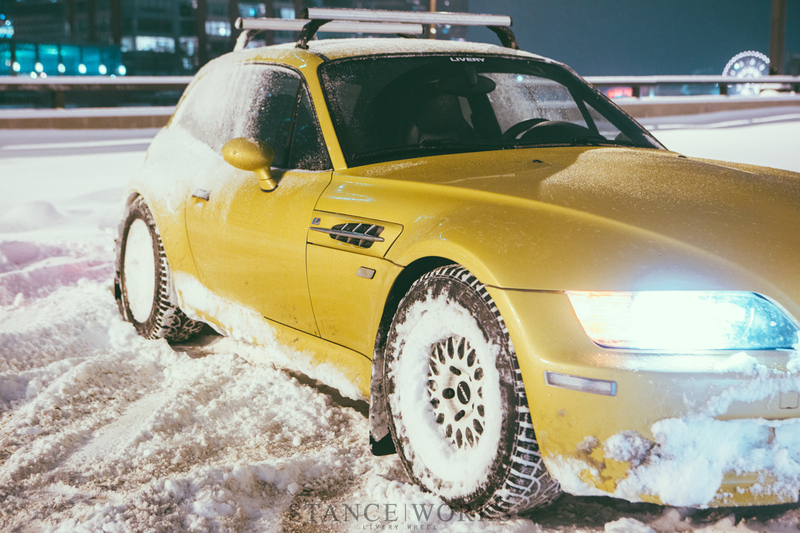 While it is definitely not easy seeing your pride and joy coated in salt and grime, it’s well worth the fun that can be had with every fresh snowfall. First of all, for a company to start off would mean making a long term customer. But first, making immediate customers happy should mean supplying them with parts, even at a premium. When asking for 16×4″ lips I was told parts individually were not sold. Even after advertising they offered them. While I understand that, the 15″-17″ centers I have are only available through a $3400 purchase. And the company does not (will not) custom suit the lip size. Livery can not offer 16″ wheels they brag so much about. For a “upcoming” wheel brand, one would think the company would be humble and readily available for underground questions. Instead, I was dismissed. All I want to know is where I can get these lips. Sorry to sound so entitled, but when marketing a obsolete and extremely limited market, it’s best to fulfill customers wishes. Instead of dismissing them as just a low profit sale and refusing information. wheelworks Hi, Larry here from Livery. I’d like to start off by saying we stand by our wheels 100%. We value our customers by making a high quality product to their specification. We offer a custom product. It takes between 6 and 8 weeks to produce from the date of payment. Our customers receive a wheel that is custom made to their specs. We absolutely custom suit the lip size, as well as center bore, bolt pattern, bolt flange, mounting style, finish etc. Please allow me to clear up some of your concerns. We do not and have not ever advertised that we offer individual parts. We are a boutique wheel company and our focus is on making Livery wheels in a timely manner for our customers. If one of our customers, or an owner of a set of our wheels needs a lip or barrel, we will accommodate their needs without question. While we do not sell rim halves for third party centers, there are other companies that do. If you’d like to email me I will happily make a recommendation. Furthermore, I checked my inbox and can’t even find your inquiry for 16×4″ lips. If that is an oversight on my part, please do forward the email and I will be happy to answer any other questions you may have. The best thing you can do to your car is to drive it, because it was made for it. 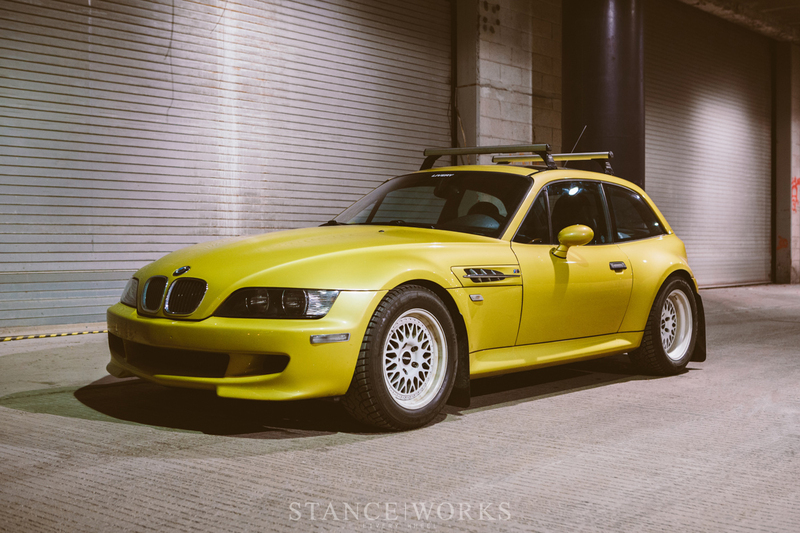 All modifications and parts, in my opinion, have no meaning if the car is in the parking lot or in the garage and this is a great example of that. Owner of this car deserves great respect! Ive never seen this car before, looks like a wagon but seems really short compared to the others. 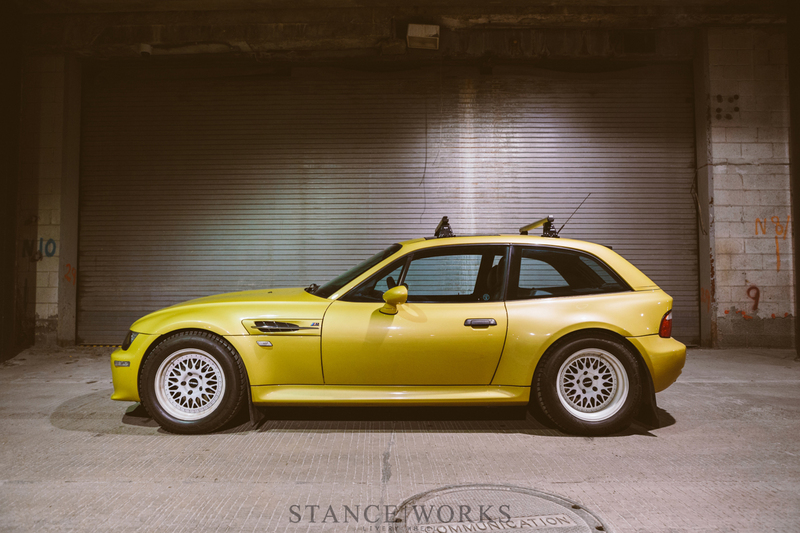 Looks good though, i really like that bright yellow. The rims however are not my type.